The life of this valiant hero and visionary is celebrated in a balletic study of his romantic life essaying his experiences of love as a young man that shaped his dreams of justice and democracy in a time of political repression. 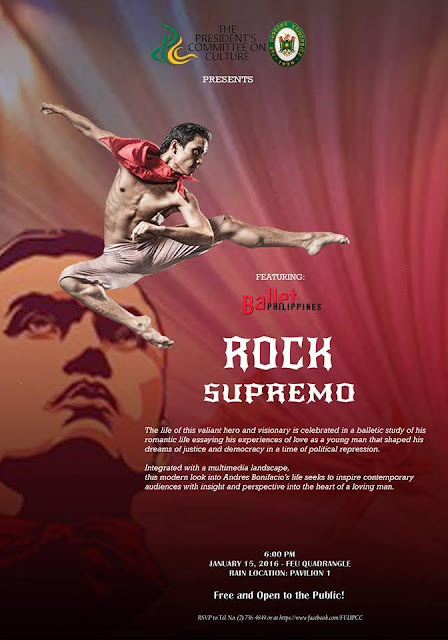 Integrated with a multimedia landscape, this modern look into Andres Bonifacio’s life seeks to inspire contemporary audiences with insight and perspective into the heart of a loving man. For reservation​, please call Ethel Ampatin or Mae Nerida at Tel. Nos. 736-4897 or 881-5225 or email us back your name and your companion for FEU gate entrance clearance.